Universal Studios Japan Celebrates ‘Harry Potter’ In New Spectacle Parade! As previously reported on Leaky, a brand new parade featuring the magic of Harry Potter started last week at Universal Studios Japan. 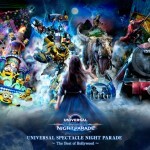 Videos of the full Universal Spectacle Night Parade have been released, giving us a glimpse at the ‘mind blowing’ experience and ‘next generation’ effects promised by Universal Studios in their announcement late last year! From videos posted online we’ve been able to catch a glimpse at the 25 minute long show, and it does not disappoint! As Dementors swarm in the illuminated sky surrounding the 360-degree viewing area, Hedwig’s Theme announces the arrival of the Wizarding World portion of the show. Hogwarts students approach, casting spells and pushing luggage trolleys lit by lanterns in front of a radiant Hogwarts Express. As the train passes you see students in the windows – obviously excited to be going to the best school in the world! It’s not long after the Hogwarts Express that Quidditch players pass by, followed by a Quidditch pitch (it appears Gryffindor and Slytherin are competing in this show). As the float passes, Death Eaters and Dementors attack, and performers begin duelling to fend them off. After this scene, a section of Hogwarts Castle approaches, surrounded by the four House banners and students fending off yet more Death Eaters and Dementors. The Death Eaters vanish with a flash and a puff of smoke, and the students cast Expecto Patronum to defeat the surrounding Dementors. The show uses projection-mapping and features original cinematic scores (using a new technology called “Show Orchestration”), immersing viewers in a full 360 degree experience. Celebrating the park’s four biggest attractions in the park (The Wizarding World of Harry Potter, Jurassic Park, Transformers and Minions), the parade is said to ‘surpass the traditional theme park parade experience’. Are you planning on visiting Universal Studios Japan any time soon? Have you read our feature on their newly enhanced effects on Forbidden Journey? Let us know if you’ve seen the show, and share your memories and photos of the Wizarding World parks with us!